Madonna, Britney, Demi, and Paris go Kabalistic! Yuri Rutman spent much of his 20s searching for spiritual fulfillment--several years before Britney started talking about her spirituality. Rutman, who grew up in the suburbs as a secular Jew, read motivational books, practiced yoga and meditated, but nothing seemed to make a real difference in his life until he started taking Kabbalah classes in Chicago. Four years later, Rutman, 31, says Kabbalah has completely changed his outlook on life. He's less ego-driven, more positive when he meets obstacles in his pursuit of a movie career, and he goes out of his way to help others. "People meet me and don't recognize me," says Rutman, who describes himself before Kabbalah as someone with a huge ego and a quick temper. "I'm the same person--I'm just not as into myself as I used to be." Kabbalah dates back to the 1200s, when the Zohar, a text offering interpretations of the Torah, was published. Interest in the Jewish mysticism has gone up and down over the centuries, and it's currently experiencing a big upswing in attention as celebrities have started practicing a form of it. Followers of the Kabbalah Centre, where the celebrities study, and its satellites--including one in Chicago--say the practice is not a religion. Though it springs from Judaism, anyone interested in making his or her life better can benefit from Kabbalah. "It's not about religion," said Dr. David Marder, a physician who works at UIC and helps run Kabbalah classes and study groups in Chicago. "This is about improving your life from a spiritual point of view." The tools of Kabbalah, such as meditation on sacred texts, help make the world a better place, Marder said. People learn to connect with energy, connect with others and with the greater community, and they learn that whatever blessings they have--money, love, energy--they should send back out into the world to share them with others. Marder says he's seen an increase in interest in Kabbalah over the last six months. About 50 people are active with the Friends of the Kabbalah Centre at 3113 N. Lincoln Ave., and more people from all kinds of backgrounds have been coming in to check out the classes or the study group, he said. The recent rise in Kabbalah popularity has its critics, though; some of them say that what's being marketed now as Kabbalah is really more self-help and New Age practices than the traditional mysticism. Rabbi Byron Sherwin, who teaches at the Spertus Institute of Jewish Studies and has studied Kabbalah for 35 years, says Kabbalah in the Jewish tradition is esoteric and advanced and requires advance knowledge of the Bible, Talmud, Jewish law and philosophy. Without those as a base, Kabbalah gets distorted. Sherwin is disdainful of celebrities who have gone public with their involvement with Kabbalah. Madonna and others have actually demeaned Kabbalah by acting as though they understand it, he said. "A tourist is not a resident--and these people are tourists," Sherwin said. He does understand why people are seeking out the 13th Century discipline--they're searching for an alternative to their current lives, and they're attracted by the fact that it's been around for so long. "It's obvious they're looking for something and think they've found it," Sherwin said. "This is a very exotic alternative." Recent followers of Kabbalah dismiss such criticisms. Rutman, who has seen Madonna and other celebs at holiday services in Florida and California, says Kabbalah's famous followers are just as serious as longtime followers. He also questions why people who haven't spent years studying religious texts and history should be left out of the joys and balance that Kabbalah has brought to his life. "Why can't all people be happy healthy and have balance in their life?" he said. Kabbalah is a Hebrew word meaning "tradition" or "that which is received." It is a form of Jewish mysticism that has been practiced for at least 500 years. It is a philosophical theology based on the belief that every word, letter, number and accent of the Torah contains keys to understanding the nature of the universe and the human soul. Much of Kabbalah is based on the writings of a text called the Zohar--or the Book of Splendor--a mystical, multivolume commentary on the Torah. 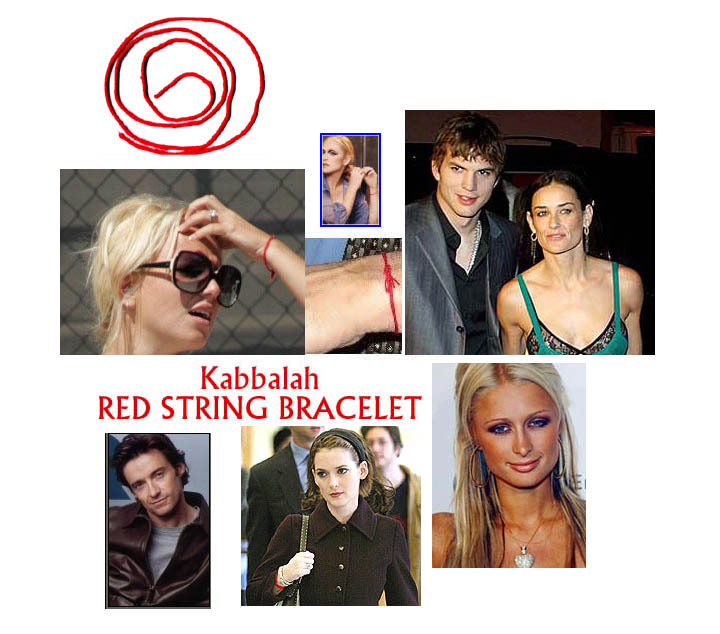 Used for centuries by the Kabbalists, The Red String connects followers to Rachel the Matriarch, who represents the aspect of protection in the physical realm, according to www.kabbalah.com. Her greatest desire and purpose in life was to protect and defend all of her children from evil. The Red String is worn on the left wrist--the receiving side of the body and soul--sealing protective energy within while intercepting negative influences that exist. Each month, about 30,000 people take Kabbalah Centre distance learning courses, and about 120,000 visit the organization's Web site-- www.kabbalah.com. At centers in the U.S. (including a satellite center in Chicago), 15,000 to 20,000 attend prayer and meditation sessions and participate in workshops, which may mix Kabbalah with yoga or reiki.--redeye news services.